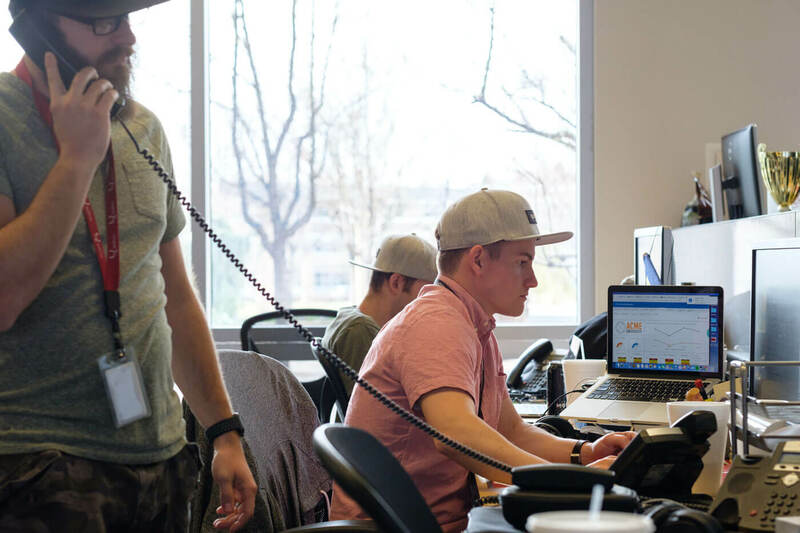 Many companies have a “sink-or-swim” ethos with sales development reps. Qualtrics, on the other hand, is dedicated to molding them into world-class salespeople. That’s partly because the company’s platform is so versatile and wide-reaching, it takes serious smarts to successfully sell it. 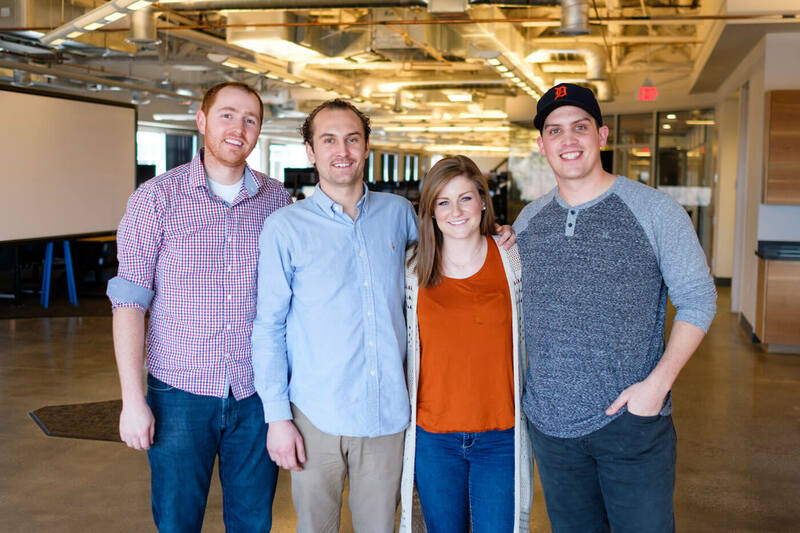 To learn more about how leadership, Account Executives, and other SDRs help the team’s newest salespeople succeed, we talked with Benji Woahn (Head of North America Sales Development), Brian Gorman (Sales Development Representative), and Mary Beth McBryde and Jake Balicki (recently promoted Account Executives). Check open roles to learn more. Left to right: Benji, Brian, Mary Beth, and Jake. Give us a sense of the day to day for someone on your team. Mary Beth: It’s a lot of training, prospecting, and emailing. We work closely with the account executives [AEs] to tee up opportunities. They also bring us into different parts of the sales process to help us learn enough to be successful when we move up. Many of us are coming straight from college or a first job. 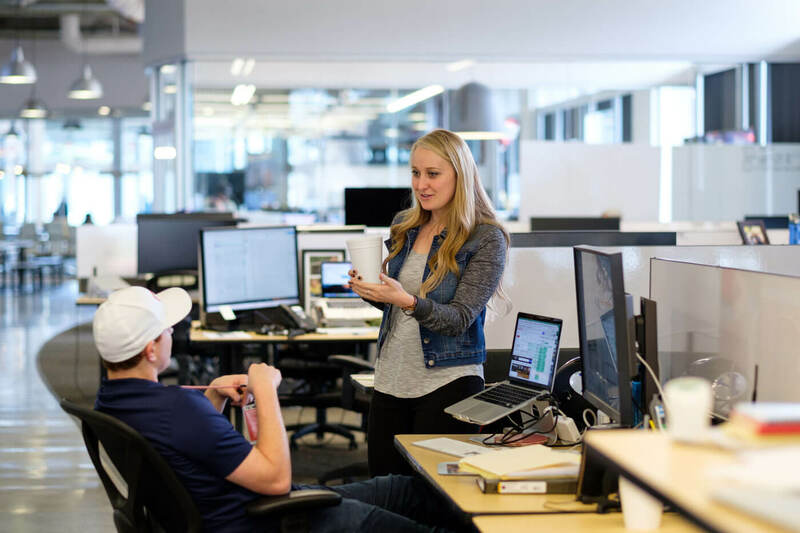 Sales development representative is generally an entry-level position, but at Qualtrics, even people with some experience usually spend time in this role. The product is vast, so it can take a while to get familiar enough with it to sell it effectively. That’s why there’s such a priority placed on training. Benji: An SDR’s day consists of many calls and emails — it’s hard. But it’s meant to be hard, because we want to provide the foundation you need to be successful in sales. You have to learn to generate your own opportunities and pipeline, learn to build deals from cold-call on, or you may fail later. Jake: I’ve been an AE for a couple of months now, and a lot of the work is similar to the SDR role, though we do have additional responsibilities since we now close the opportunities we create. I really appreciate that I got so much training in those foundational skills, since now I’m able to apply those skills successfully. Day to day, I’m still spending the morning making calls during prime hours, then I move on to email contacts and finish with more calls. We also do an hour of self-development each day; there’s a lot of emphasis on learning here. 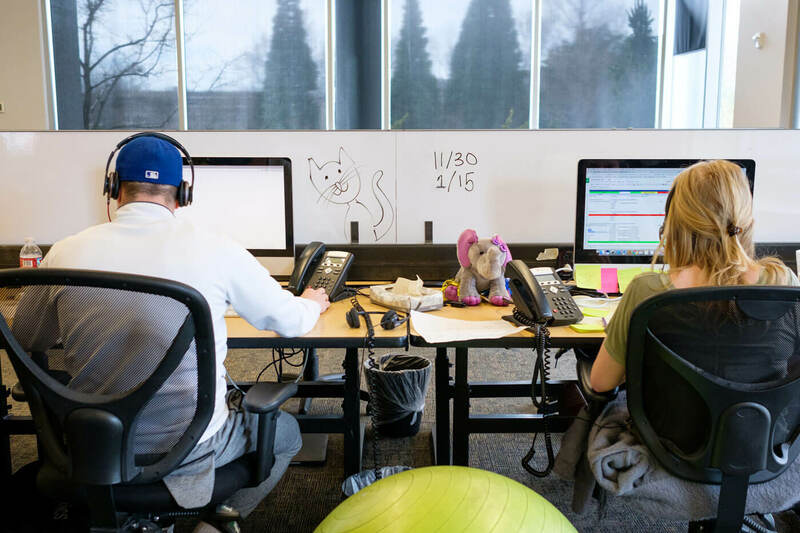 Above and below: A typical day for SDRs consists of conversation, collaboration, and calls. 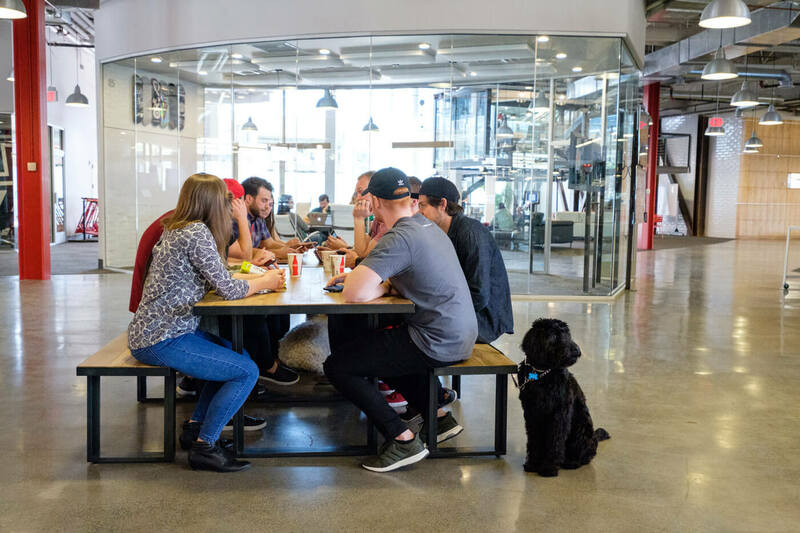 Team members gather for a meeting over snacks while a furry friend stands guard. Can you tell us more about the training SDRs receive and why it’s important? Benji: Someone who joins Qualtrics as an SDR might be able to join another company as an account executive, which is a sexier title. But in reality, that person isn’t prepared or trained to do the job. They’re slapped with a big quota and told to hit it, but not given the necessary tools. 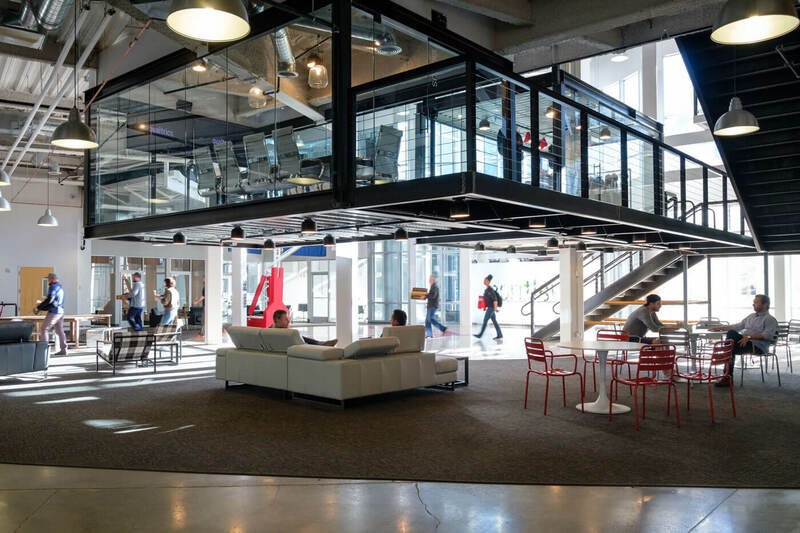 At Qualtrics, by the time you’re assigned quotas, they feel attainable. We all know how to generate leads because we’ve all started from the beginning. Once you have that sales development foundation, you can move with confidence to the AE team, where they focus on closing skills. Mary Beth: We receive a lot mentorship and opportunities for self-development, including formalized training programs for Level 1 and Level 2 SDRs. Every week, we have a general training with both groups, and then dig into specifics in the separate groups. For example, the Level 1’s just received training sessions in basics like the ideal cadence of calls and emails. 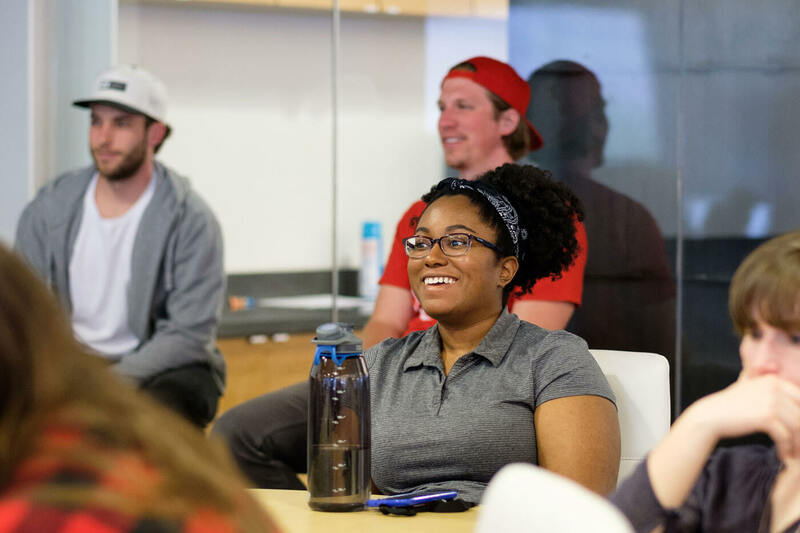 When we promote into a Level 2 role, we learn how to run initial meetings, how to bring in the AE, and how to identify and respond to a potential client’s most pressing needs. The training is very organized and step-by-step. They’re not throwing it at us all at once or setting overwhelming expectations. Brian: The sales development process is actually what drew me here. 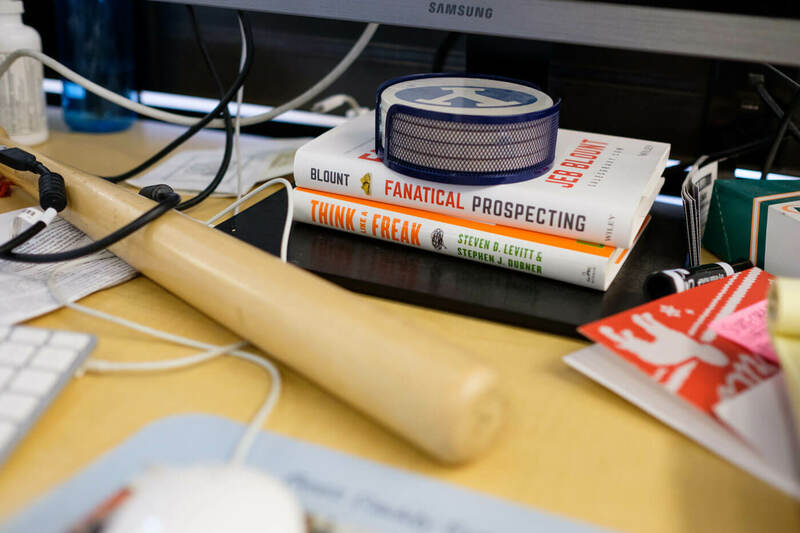 The building blocks are carefully thought out; you’re not ready to be a successful AE until you learn to put the different pieces into place — prospecting, responding to objections during a call, deep knowledge of our products. Mary Beth: We also do SDR graduate training beyond Level 2, as you move into an AE role. That includes refresher courses, making sure we’re not forgetting the fundamentals. It’s a continuous training model; no one believes they know everything. There’s always more to learn. And everyone here is so supportive. We share our email templates and what’s working on calls. Everyone wants you to do well. We’re also aware that formal training is not a substitute for experience. You’re not ready for the next step until you get off a call where someone straight up tells you “No” and you can say, “Wow, that sucked,” then pick up the phone to dial the next one. Sales development gives us plenty of chances to practice not taking a negative response personally. Above: Lunch is catered Monday, Wednesday, and Friday. 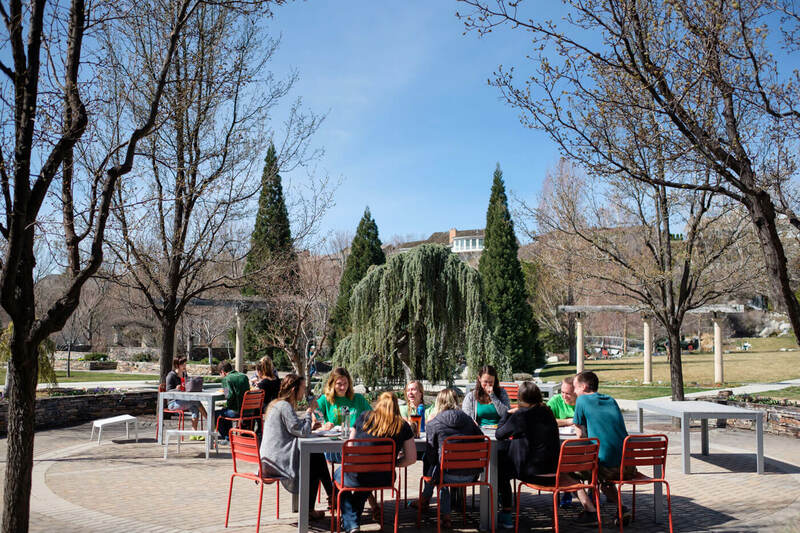 Below: The Provo office offers a variety of outdoor spaces for enjoying some fresh air over lunch. 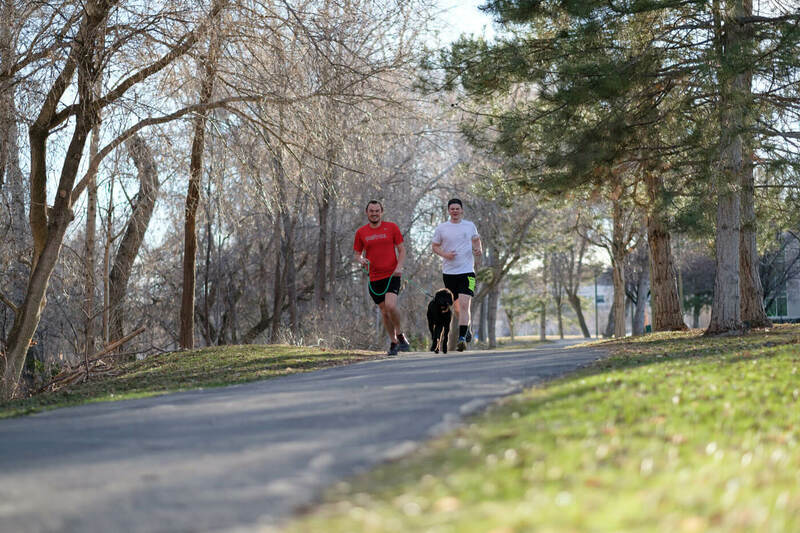 Above left: Kendall Tingey and Garrett Wessman head out for a run. The trailhead is a few minutes from the office’s front door. 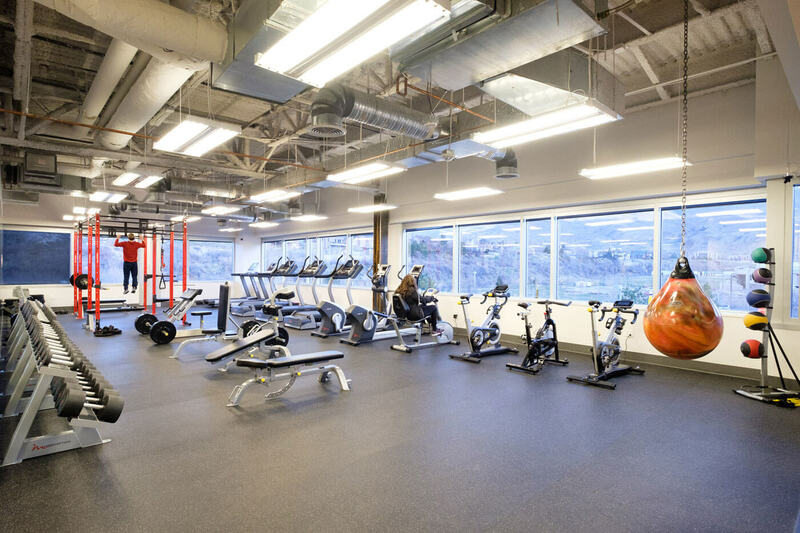 Above right: The Qualtrics gym. 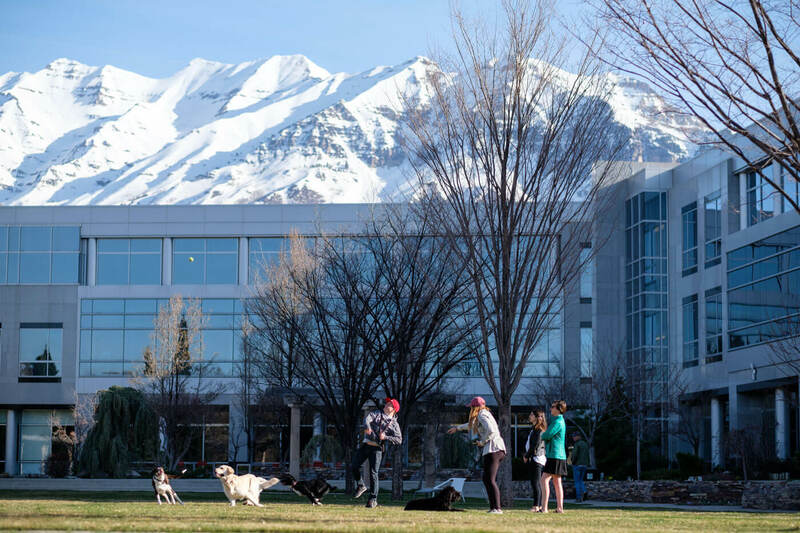 Team members take a fetch break with beautiful Provo as a backdrop. 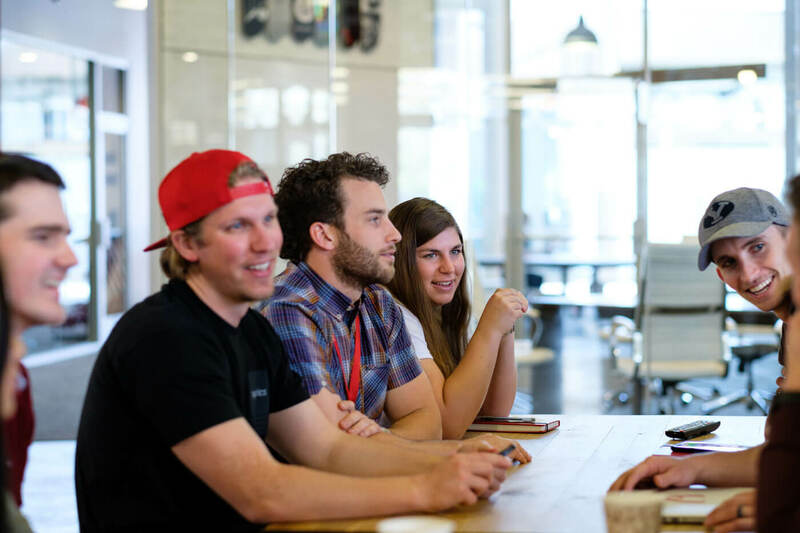 What have you learned since joining Qualtrics? 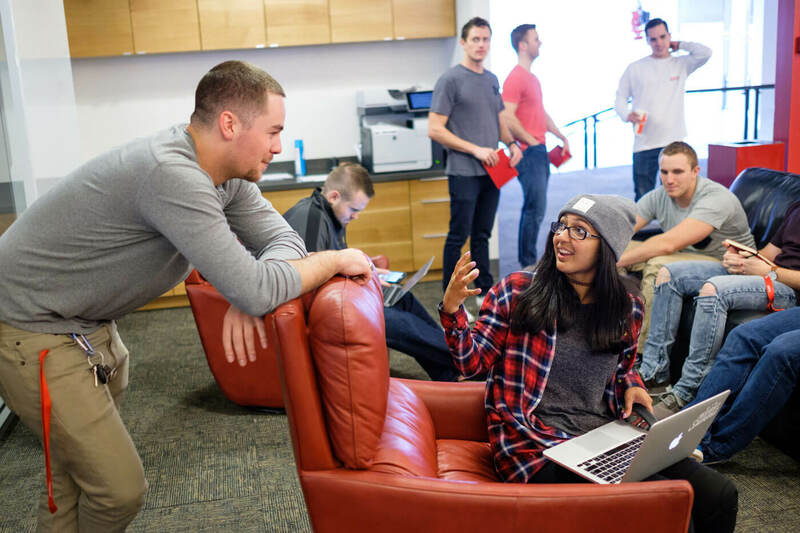 Jake: I arrived at Qualtrics straight from college, and in my first six months as an SDR, I learned more than I did in all four years of school. You can read everything, study different processes — but you’ll always be missing something without experience in the trenches. That’s part of the reason we join the initial qualifying meetings with the AEs. Those are challenging and fast-paced calls; you have to be quick on your feet. As an SDR, you have the chance to participate without the weight of a quota on your shoulders. Benji: Each team member is also encouraged to learn as part of their daily work. Everyone gets an hour of self-development every day to study or work on areas they identify as needing growth, whether that’s sales skills, their knowledge of our products, or learning more about a particular industry we want to pitch to. While we do encourage extracurricular learning, we make self learning part of our regular work day, rather than assigning homework, because it’s that important to us. Mary Beth: I don’t have as much experience with tech, so I might use my self-development hour to read or ask my peers about technologies relevant to my sales efforts. Or I might just listen to a colleague in a call or meeting to learn from their terminology and tone. I’m also part of a women in leadership discussion group; right now we’re reading Lean In. 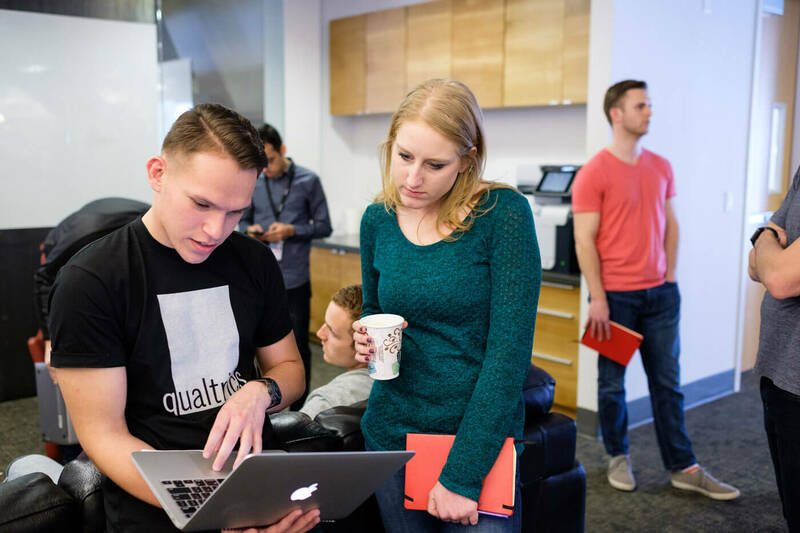 Tell us about what you were doing before Qualtrics, and what brought you here. 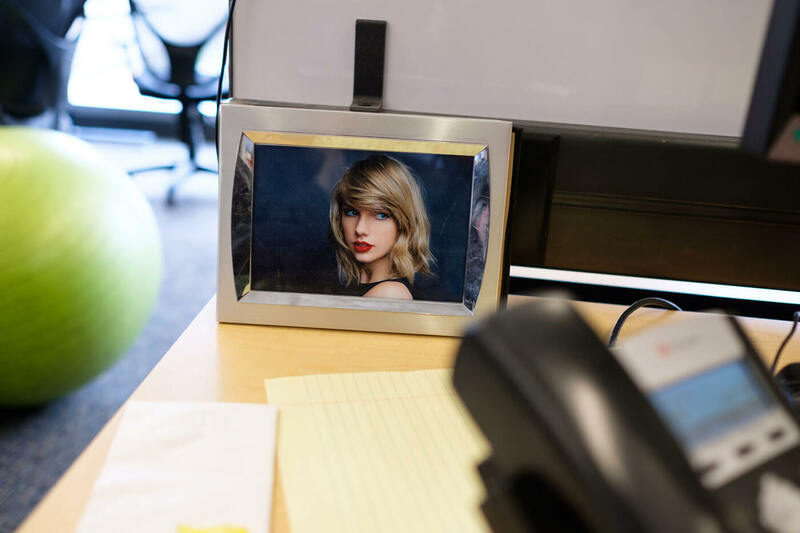 Mary Beth: In college, I had an internship selling consumer packaged goods, and I hated it. It almost turned me off sales altogether. But it turned out the product was the problem, not sales: I was telling people they needed something I knew they didn’t. I was all set for grad school in Chicago when a Qualtrics recruiter called. I’d used the platform when I worked for a market research professor, so I knew it had practical, real-life application. During my interviews I could tell this was a place that would invest in me and that I wanted to invest in. 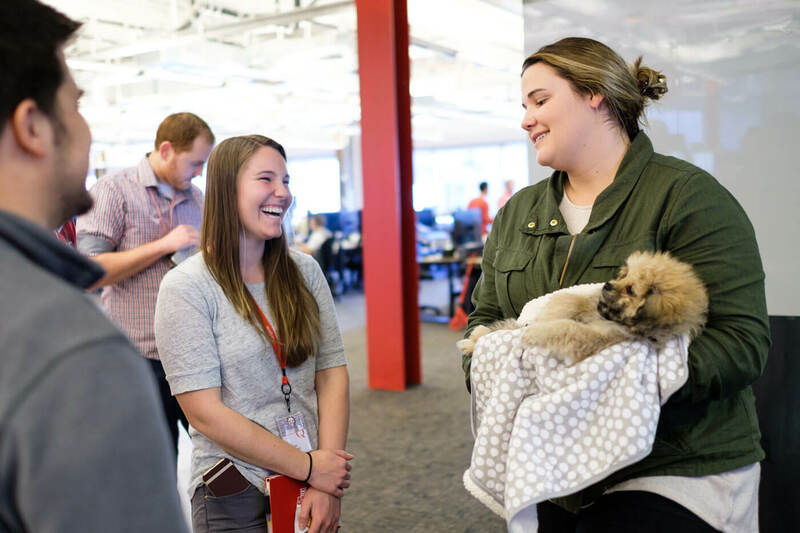 And the more I learned about the office culture — dogs allowed, food provided, wear what you want — the more I felt there was no other option. I was moving to Utah. I love to ski, so the office being a few minutes from the mountain didn’t hurt, either. Brian: I spent a year and a half in a run-of-the-mill corporate job after college. I was leading a team supporting a couple hundred people, but I felt stuck, like I didn’t have control over the trajectory of my career. 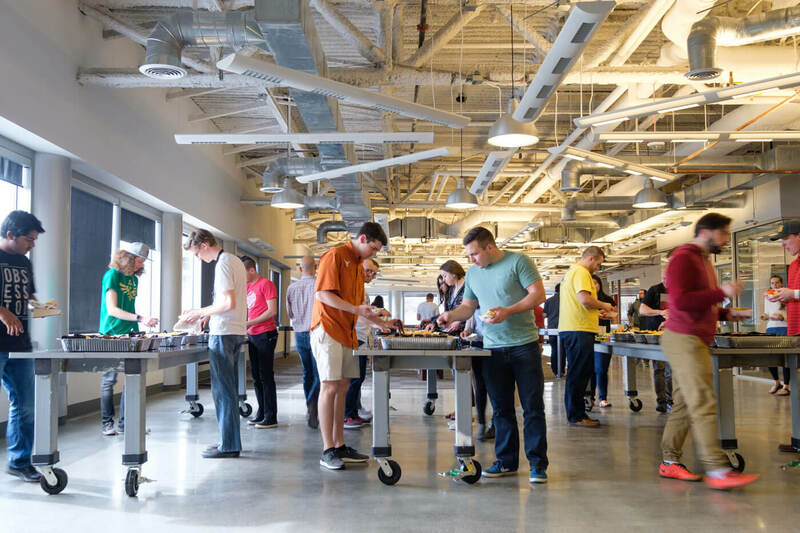 When I interviewed at Qualtrics, it was clear the culture would push me to level up. I saw that everyone had business books on their desks and was constantly eager to learn. I wanted to be surrounded by talented people every day, and that’s exactly what I got. Jake: I basically had no relevant experience. I was a stats and psychology major in college, I played baseball for two years, and I painted houses and mowed lawns. 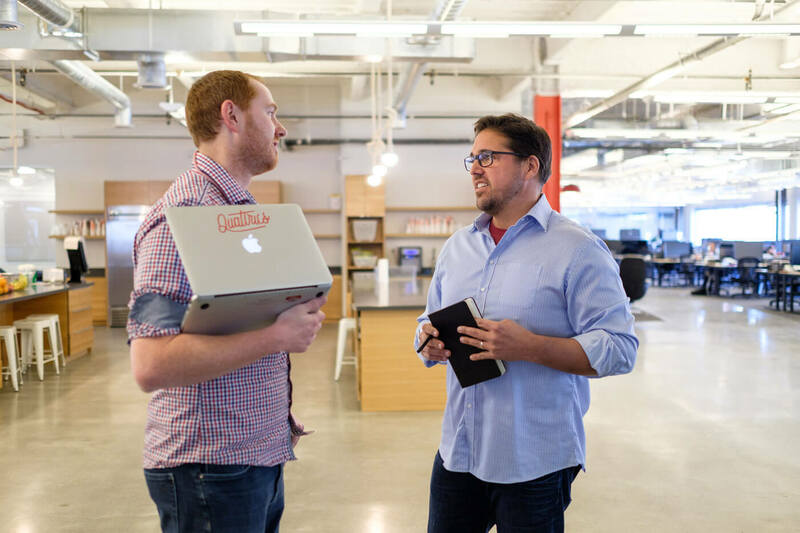 At a career fair, I met a Qualtrics recruiter who described sales as “learning about businesses and finding solutions to meet their needs,” which sounded like the perfect mix of psychology and numbers. As Brian said, there’s so much opportunity to own your own career success here. 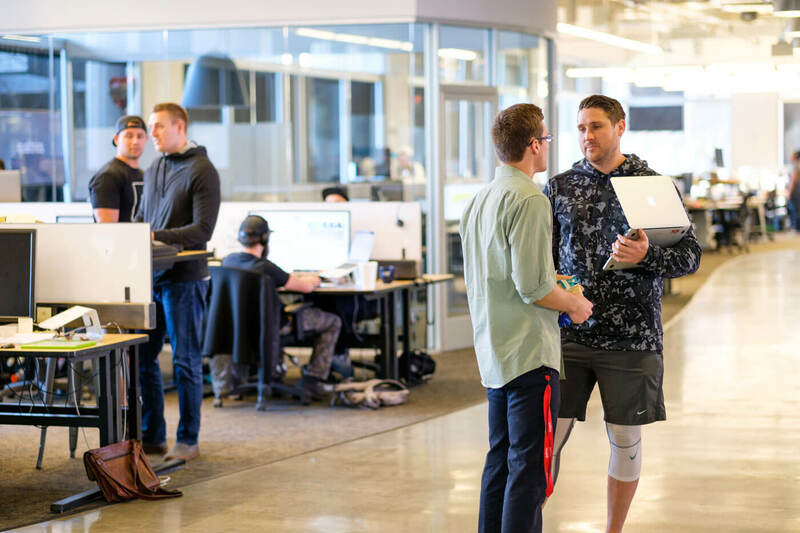 I turned down an offer for twice as much money because of the room for growth I saw at Qualtrics. Benji: Before I came here, I was still in school at BYU and working at a horrendous job in retention. Basically, people would try to cancel their services and my job was to stop them. 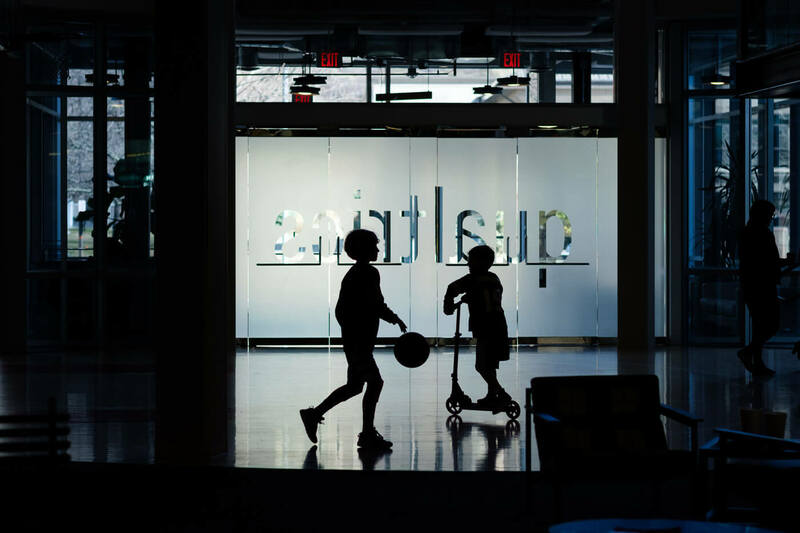 I had a buddy who would not shut up about this company, Qualtrics, and I decided to apply. It wasn’t for a sales job; I’d studied organizational behavior and thought I wanted to be involved in training. 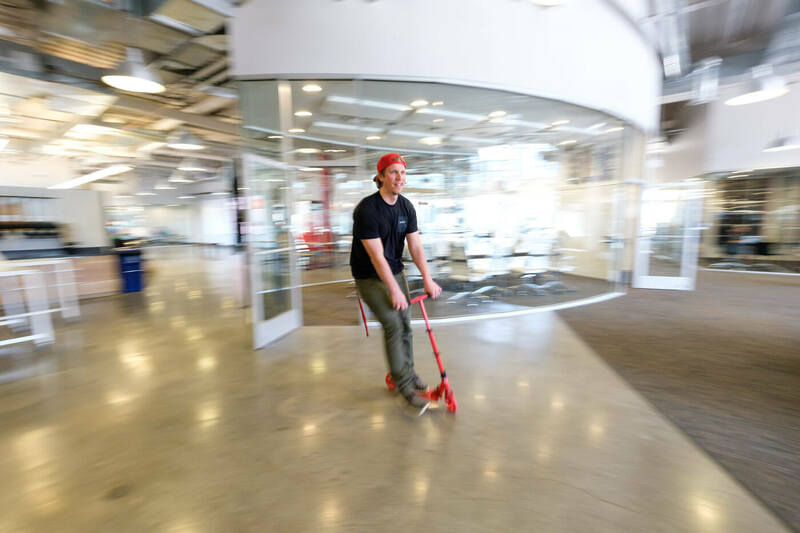 This was years ago, and Qualtrics was small, probably 35 employees in a podunk building. The cubicles were mismatched; no one had the same chair. I was not exactly impressed. And then they rejected me! I remember thinking, “How in the world is this dump of a company going to tell me no?” But I applied for an SDR role a couple months later, and was hired. Seven years later, I’ve run a large portion of the North American Account Executive teams, and currently run the North American Sales Development teams. Above left and right: Frequent communication and collaboration are core to an SDR’s development. Also, cute dogs. John D’Agostino, Global Head of Sales (center, far end of table), meets with the entire SDR team for an Ask Me Anything session. Whitney Macon, a member of the SDR team. Left: John D’Agostino responds to a question during the Ask Me Anything session. Right: Benji and John talk shop. 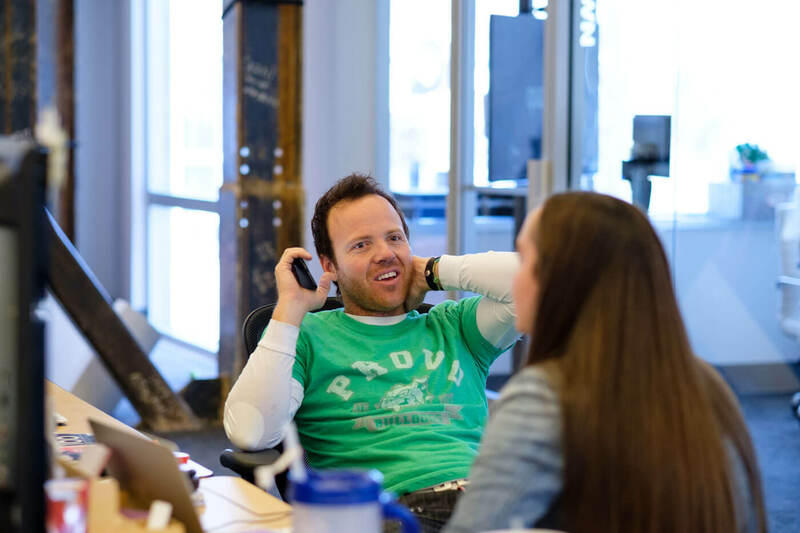 Are there misconceptions about sales you had, or that others have, that Qualtrics disproves? Brian: Some people think sales is a kind of vacuum, meaning you’ll be stuck doing the same thing for years. I’ve only been here three months, and I don’t believe that at all. There’s plenty of opportunity for growth within Sales, or you can shift into something else. Working in a sales role cultivates resilience and the ability to handle adversity; there are days when you feel like you’ve hit rock bottom and days when you feel like you’re on top of the world. Learning how to deal with those variations prepares you to excel in any job. What do you say to people who think sales isn’t intellectually challenging enough for them? Jake: What we’re doing isn’t normal cold-calling. A script would be useless because we’re working with a thousand companies in a thousand different ways. Many of the companies I’m calling into now haven’t ever thought about market research or the voice of the customer. We need to know their industry better than they do; we have to be prescriptive and help them understand the value of market research and collecting customer feedback. Essentially, we’re selling an opportunity that may have been completely unknown to someone before they picked up the phone. Mary Beth: Qualtrics is a complex product that is relevant to pretty much any business. That has a big upside, but it means the next prospect you call could be from an industry you’ve never dealt with before. We need to have enough expertise to talk meaningfully with hospitals, market researchers, big tech companies, and small family businesses. We’re often talking to people who are much smarter than us and at the cutting edge of their own fields, and we can’t be intimidated. 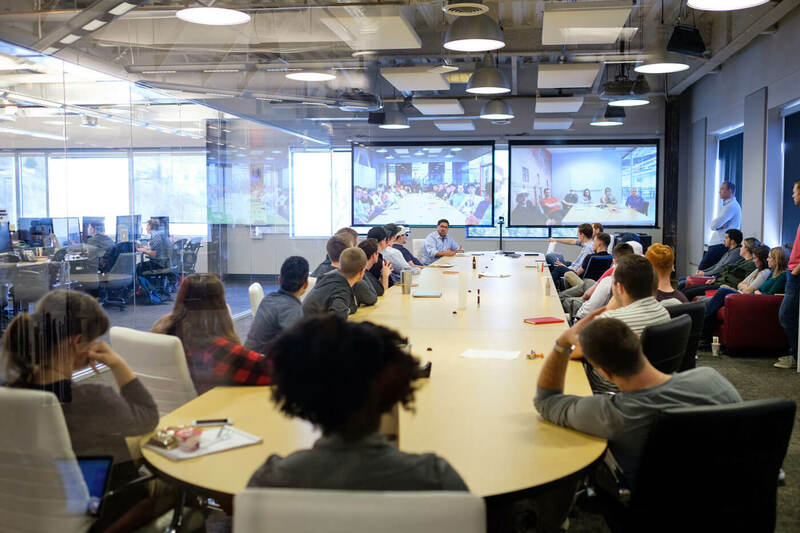 Our immersion in the product and training gives us the confidence to say, “Yes, I’m 23, but I promise, I really do know how Qualtrics can help your company.” It requires a natural intelligence just to persevere when someone with 20 years more experience tries to dismiss you right out of the gate. 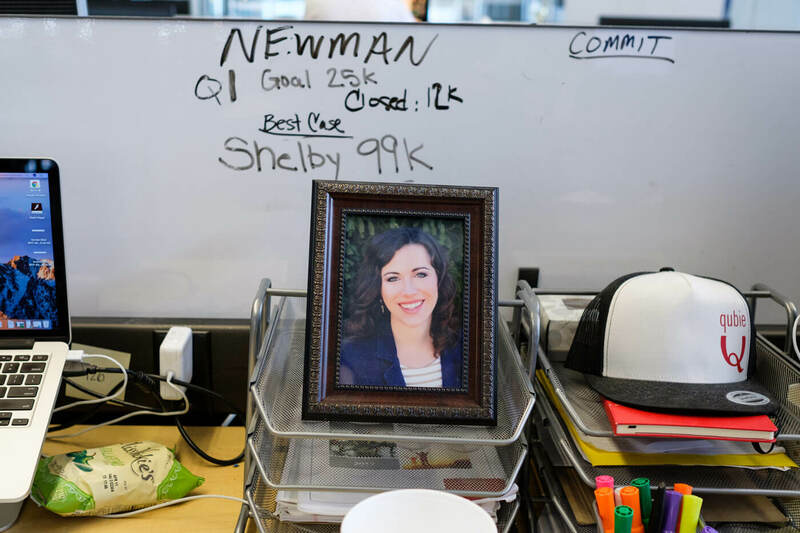 Above: Team members personalize their work areas with photos of loved ones. Below: Words of inspiration and wisdom. 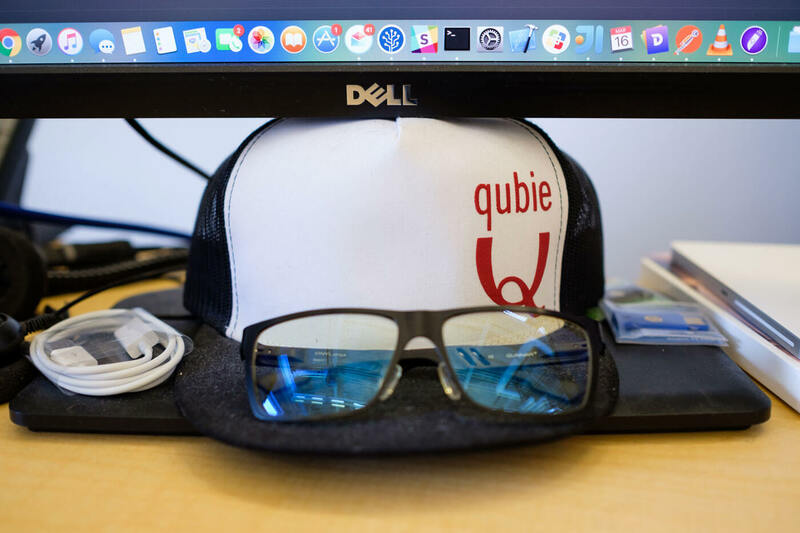 Sweet swag (“Qubie” = Qualtrics newbie). 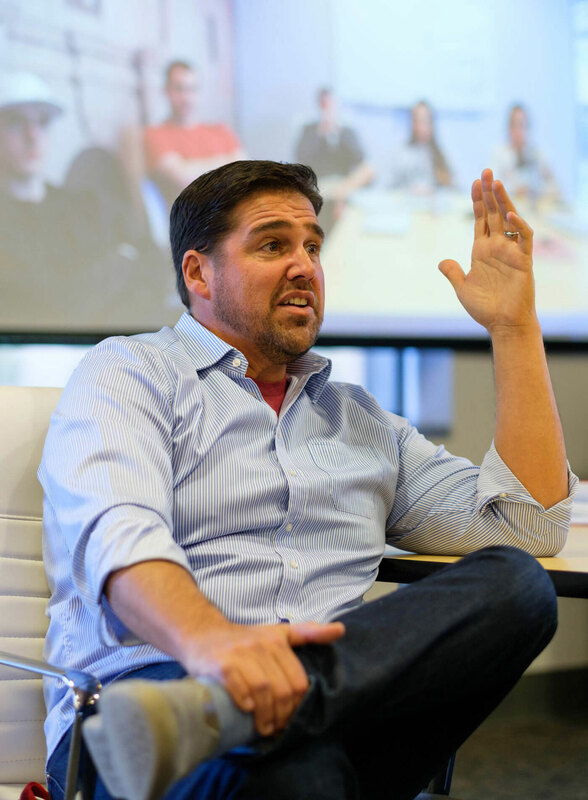 Benji: We recruit people who demonstrate the ability to meet challenges head-on, and who are willing to do difficult things to accomplish incredible rewards. They need to be adaptable, too. 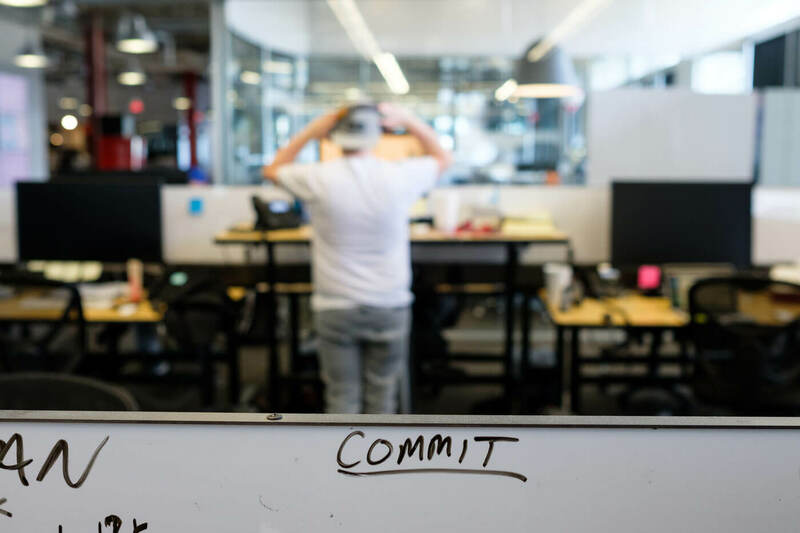 In just the last eight or nine months, we’ve evolved so much around our sales structure and the metrics we’re tracking — all toward the two goals I mentioned: developing leads and training SDRs into AEs. A lot of people couldn’t handle the changes, and weeded themselves out. What are an SDR’s key success metrics? How does someone know they’re progressing? Jake: In Sales Development, our primary objective is to create opportunities for AEs to close. SDRs are compensated based in part on the number of those opportunities that are accepted. If the AE thinks there’s potential for the deal to actually close, it’s considered an accepted opportunity. Usually that means you’ve cold-called a prospect and confirmed they have an interest in Qualtrics. Another metric for SDRs is the estimated value of a potential deal. Though we’re aiming for quotas, we also want to keep an eye on the bigger value for the company: revenue. Benji: There are two other key success metrics for SDRs. One is if they are contributing to AE productivity. The other is decreasing what we call “ramp time,” which is the time it takes a new hire to start hitting their quota. You’re expected to have shorter ramp times as an account executive, because you’re further along in the deal cycle. 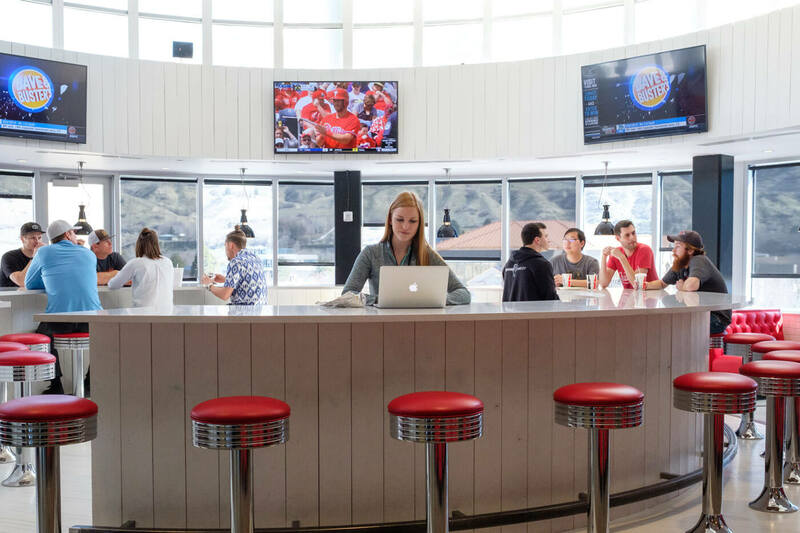 Team members can work (and eat) at The Hub, a top-floor, 50s-inspired soda counter. Above left: At end of day, team members review March Madness highlights. 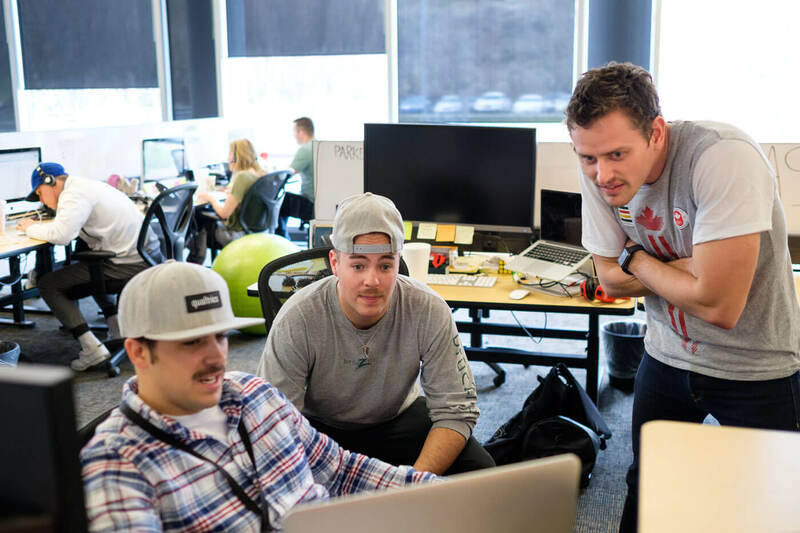 Above right: Qualtrics’ CEO, Ryan Smith, has a background in Sales. Benji, it sounds like you’ve been here since the really early days. 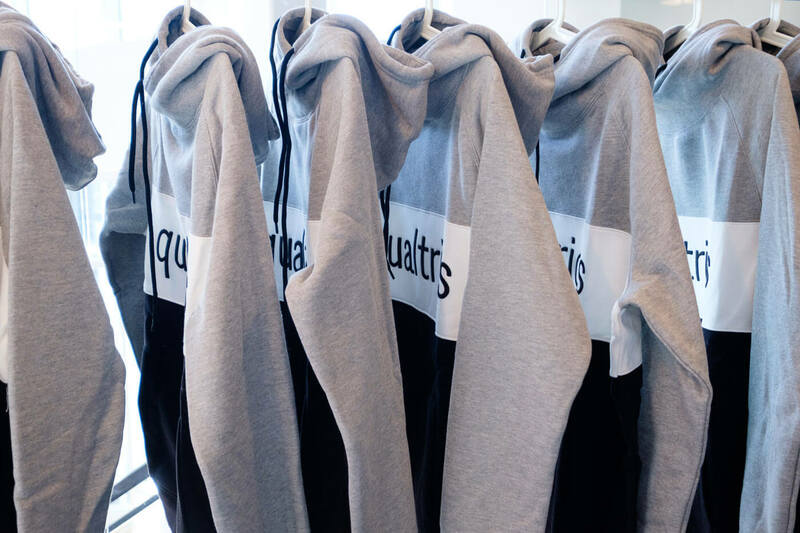 How has Qualtrics changed since then? Benji: Oh man, so much. Like I said, when I started, we had 35 or 40 employees in the whole company. I joined when I was still in school, and I thought I’d be here for a year and go elsewhere after graduation. But then I started to see that when our co-founders presented an idea, it actually ended up happening. And that changed people’s attitudes; gradually we started to believe this could be the real deal. I remember one day very early on when I walked home with a $72 paycheck. I was young and married with a kid, and my wife was pregnant. She gave me a long look and asked, “What are we doing?” But we saw the company’s potential, and were ultimately very excited. I remember one of our co-founders showing us maybe the first news article about Qualtrics that was published outside of Utah. The company was starting to get attention, and knowing that inspired us to stay, to be a part of it. People who had been talking about leaving started saying, “I’m going to stick around.” It’s comical to think such a small recognition made our whole month back then. Seven years later, we’re a global company with 1,300 employees; it’s mind blowing considering where we came from. The consistent theme has been our scrappiness and grit, and everyone at the company being 100 percent bought into what we’re doing. That’s what brought us to where we are now, and it’s what still makes me excited to come to work every day. All are welcome on the Qualtrics court.